It's hard to believe that it taken as long as three years for Brisbane rockers Giants Of Science to finally getting around to releasing the follow up to their critically acclaimed debut full length album The History Of Warfare (Which was the rather quick follow up to 2001's equally impressive E.P. Blueprint For Courageous Action), but after a couple of years of successful touring (With the likes of A Perfect Circle, Mudhoney, MC5, Black Flag, the Livid Festival, and a host of national acts), they're back, and better sounding than ever! Much like the progression from their E.P. to their debut album, Here Is The Punishment (Their first for Plus One Records after previously being signed to Rhythm Ace Records) again shows a push towards uncharted territory for the four piece act (Who are vocalist/guitarist Ben Salter, guitarist/vocalist Benjamin Tuite on guitars, bassist Matt Tanner and drummer Steven Lynagh), with the dozen tracks this time around covering everything from driving rock, to a far more revealing softer underside to the bands sound. The opening number (And current radio single) Here Is The Punishment is typically Giants Of Science sounding with it's driving riffs and the irresistible harmony work in the chorus vocals, but even from the outset, there's a definite sense of growth and maturity within the song writing, which is somewhat familiar, yet new sounding style wise. Zodak (Evil Cosmic Enforcer), If You Love The KT26ers (An alternate version of a track originally known as Cold And Dead) and Snowpea keep up the rocking tradition of the bands past with infectious kicking power and progressive sing along choruses, while tracks such as Annabelle, Mega Fauna (Featuring guest vocals from Sarah and Elizabeth Kelly of The Red Sun Band, not to mention featuring some interesting banjo work), Mouth Shut Tight, Tanner's bass led short instrumental piece Vote One and the melancholy Anchors Up project a slower, more thought provoking and introspective side to the band, all without losing the qualities (The harmonies within their catchy melodic rock format) that makes the band so special in the first place. Of course, it's not all serious. Sisters is essentially a reworking of the Annie Lennox/Aretha Franklin hit from 1985, but with a distinctly modern Giants Of Science take on things (In other words, they're better off without men! ), while the blues tinged Larry and the barnstorming closer Dead Sea all show that there's more than two sides to the album (If that's possible). 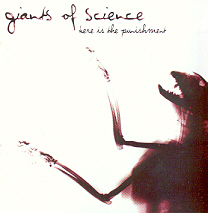 Here Is The Punishment is by far Giants Of Science's most diverse effort, as well as being their most polished and balanced overall release to date. This is another triumph for the Brisbane band, and one that will definitely be punishing my stereo for quite some time yet.